There is something special about street corners, don´t you think? People make appointments to meet there, unexpected things happen around the next corner. So dear reader of The F Blog - go and have a look in your archives or shoot some pictures from street corners. 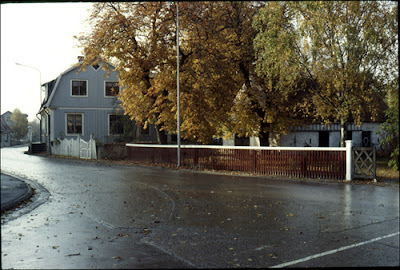 The picture above is back from the 1970s - a street corner in a small village, just to give you an idea of that it doesn´t have to be a corner in Tokyo, New York or Paris. We have published some posts here about Alfred Stieglitz and the legendary journal Camera Work. Please also have a look at the beautiful site www.photogravure.com to find out more. "In 1916, Strand made a series of candid street portraits with a handheld camera fitted with a special prismatic lens, which allowed him to point the camera in one direction while taking the photograph at a ninety-degree angle. This seminal image of a street beggar was published in 1917 as a gravure in Stieglitz's magazine Camera Work and immediately became an icon of the new American photography, which integrated the objectivity of social documentation with the boldly simplified forms of modernism." 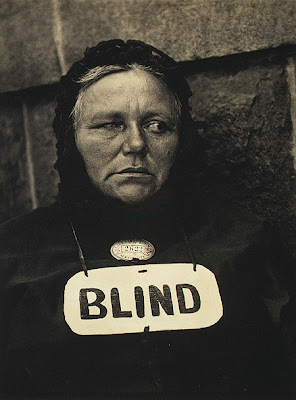 "Paul Strand: Blind". In Timeline of Art History. New York: The Metropolitan Museum of Art, 2000–.www.metmuseum.org.